The British love of beef, and particularly for lunch on a Sunday, is nothing new, as it is such a part of the national identity, that even the French call us "rosbifs" (roast beef). 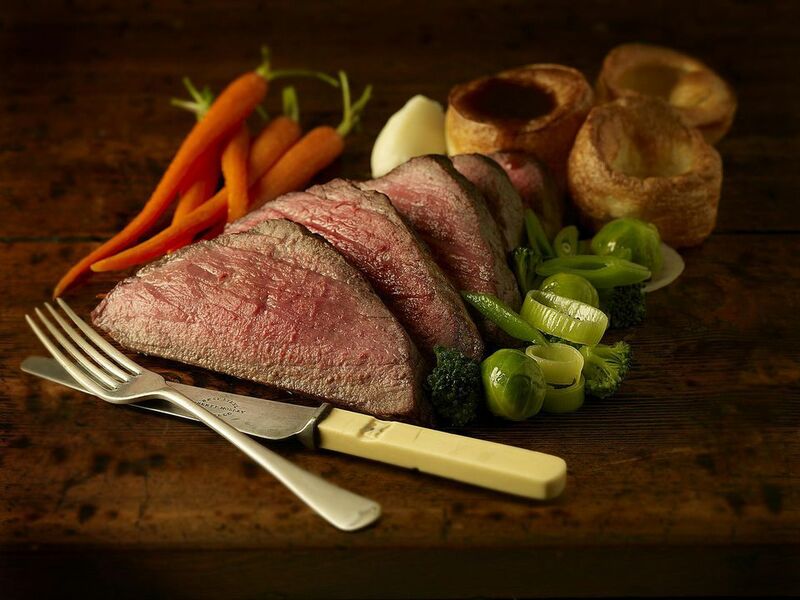 The Sunday Roast came to prominence during the reign of King Henry VII in 1485 and the Yeoman of the Guard–the royal bodyguard–have affectionately been known as "beefeaters" since the 15th century because of their love of eating roast beef. Startlingly, contrary to modern thinking about meat eating, in 1871, William Kitchener, author of Apicius Redivivus or The Cook's Oracle, recommended eating 3 kg (6lb) of meat each week as part of a healthy diet (he also recommended 2 kilos of bread and a pint of beer every day). Today in the UK, we eat approximately 1.5 kg of meat each week–only 200g of which is beef–and some think even that is too much. Kitchener also describes in the book how to roast "the noble sirloin of about fifteen pounds:" before the fire for four hours for Sunday lunch. This method of hanging the meat on a spit, or in the 19th century, suspended from a bottle-jack and indeed that size of a joint, demanded a sizable fireplace to feed a large household, not only on Sunday but as cold cuts, stews and pies throughout the week. The less well-off did not have the luxury of a large fireplace or the money for much meat, so the smaller weekly roast would be dropped off en-route to church at the baker's and cooked in the cooling bread ovens–bread was not baked on a Sunday. With access for all to cook meat on a Sunday, the tradition of the British Sunday lunch began and still continues today. The ubiquitous partner to the roast was and still is a Yorkshire Pudding. The pud was not served alongside the meat as often seen today. Instead, it was a starter dish served with lots of gravy. By eating it first, it was that hoped everyone would be too full and eat less meat on the main course (which of course was very expensive). Though meat is no longer roasted in front of the fire, and today is baked in the modern oven, we still cling to the term "Sunday roast." On Sundays throughout the UK, pubs, and restaurants are packed full for the roast dinner–some even serve the meal on other days of the week, such is its popularity. But for many, cooking and serving Sunday lunch at home is the very heart of British food and cooking. It is the time for families or friends to get together and share great food. What Else Is Part of a Sunday Lunch? "The Roast Beef of Old England," an English patriotic ballad, was written by Henry Fielding for his play The Grub-Street Opera, first performed in 1731.